KIEV, Ukraine -- Ukraine hopes to work out a new deal on the supplies of Russian gas by late May, after Russian president elect Vladimir Putin assumes power, Ukrainian President Viktor Yanukovich said on Thursday. Ukraine's Viktor Yanukovych with Russia's new President Vladimir Putin (L). Yanukovich's government has sought for more than a year to negotiate a lower price on Russian gas but talks have produced no results so far. Kiev, which is paying $416 per thousand cubic metres, sees a fairer price at $250. 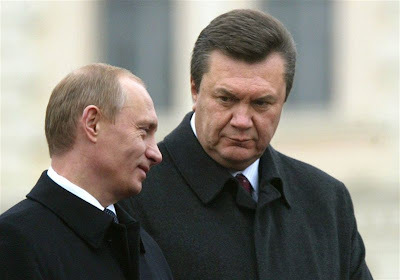 "Expert groups are working right now, and we hope by the end of May, by the last decade of May, an acceptable solution will be found that we will discuss with... Putin," UNIAN news agency quoted Yanukovich as saying on a trip to the south-eastern city of Zaporizhya. Yanukovich, who met Putin in Moscow this week said he also planned to meet the Russian prime minister in mid-April, before his May 7 inauguration as president. Ukraine's government says the high price of imported gas is a drag on the country's economy and state budget. Ukraine heavily subsidises gas supplies to households and heating companies. Rating agency Standard and Poor's downgraded its outlook on Ukraine's credit ratings to negative citing, among other factors, the "lack of clarity over the ultimate direction of government policy" with regards to gas talks with Russia. Russia has long insisted it would review the price only if its giant gas company Gazprom was allowed to take over Ukrainian gas transit pipelines or if Ukraine joined a Russia-led Customs Union. Kiev has so far dismissed both options. However, Yanukovich is now under political pressure to deliver a solution to the gas issue as his Party of the Regions has been slipping in opinion polls ahead of the October parliament elections. Previous price disputes between the two nations have led to disruptions of Gazprom's supplies to Europe through Ukraine's territory, prompting Russia to create alternative export routes that bypass Ukraine.